First off, great title. That alone made me want to hear this release, and then the music absolutely paid it off. So what is the music, you ask? Ah, well, that’s a trickier thing. As Intersonic Subformation, Richard Lisaj does an excellent job of dodging conventional tags. 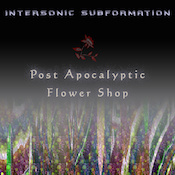 The four pieces on Post Apocalyptic Flower Shop have their own unique identity but each show elements of dub, electro-acoustic, and traditional EM. The ride is over in less than half an hour, but what an interesting ride it is—even if, after listening multiple times over, I can’t quite find the words to explain it. “Roses (White: Voices Inside Darkness)” could be seen as the ambient track. Or more-or-less ambient. Waveform pads rise, expand, and fade over chimes and a quiet bed of clattering percussive noises. Something in the tone puts me in mind of the theme song from Twin Peaks. “Orchids (Pink: Beauty—It’s Neither Lost Nor Found)” brings guitar into the mix, the warm acoustics lending a folk-like feel over chugging electronics and more pads. This, obviously, has the strongest electro-acoustic side and also pings certain unidentifiable retro centers in my brain. Wait, I know…it’s dredging up memories of Oldfield’s Amarok in places. (Big synth chords late in the track sound so very familiar…) “Lilies (Yellow: Timebent)” gets a bit Berlin-ish with spacey twirls off the synth and sliding guitar notes. The keys take over, mid-track, and Lisaj does his best to numb out brains with repeating notes that warp and wobble as they pass. “Tulips (Purple: Welcoming the Unknown)” comes out with a super-strong retro feel courtesy of a tick-tock sequencer rhythm and noisy electric crackles. You will be excused for thinking you’ve slipped into an old Tangerine Dream track. This is the longest track on the album at 13:30, and Lisaj plays with form as he goes. While the track stays true to its beginnings, it changes shape slightly, re-expressing itself a couple of different ways, all of them equally fun. Overall, Post Apocalyptic Flower Shop is a lot of fun to dig into. It feels like Lisaj builds each piece a bit more on the last one—an idea that’s borne out a bit by noting that each track is longer than the one before it. Clearly, I like this as much for its retro vibe as for its modern, innovative side. I like when familiar sounds are bent into fresh shapes, that workable blend of “this is where we were, this is where we are.” At less than half an hour in length, this one skates right past, but will garner its share of repeat listens.